Hard-boiled eggs are the perfect, go-to snack. They’re easy to make, packed full of nutrients and, of course, delicious to eat! But are you struggling to peel them? If you’re trying to cook and peel a freshly laid egg, you may want to think again. Fresh eggs are more difficult to peel when hard-boiled. Why? The albumen (aka – egg white) sticks to the inner shell more strongly than it sticks to itself because of the less acidic environment of the egg. As an egg ages, the egg shell becomes more porous and absorbs more air. The air space between the egg shell and the membrane begins to get larger, and the acidity of the egg starts to decline. Research has shown that this increase in air space and reduction of acidity helps with peeling! So next time you’re looking to ease the peeling process, use eggs that have been in your fridge for at least 7 days. Note: Always refrigerate hard-boiled eggs in their shells after cooling. Use them within one week. If they’re peeled, use them within one day. How Can I tell if My Eggs Are Too Old? 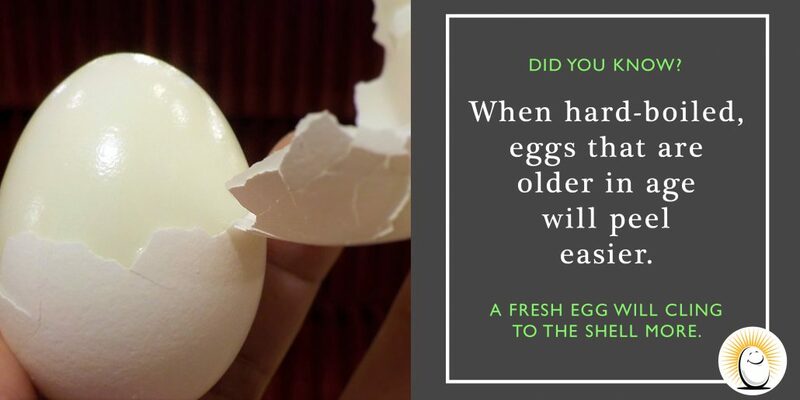 Wondering if your egg is too old to eat? Use this quick and easy ‘water test’ to check your egg’s freshness. Place your egg in a cup or bowl of water, making sure the water goes above the egg. If the egg sinks and lies flat, it’s a fresh egg! If the egg starts to stand, it’s aging, but still fine to eat. If the egg floats, toss it! New Year’s Eve & Day Recipes Are Brown Eggs Healthier Than White Eggs?